The Rotary Club of Applecross supported the project being coordinated by the Rotary Club Attadale for the construction of a building at the St Yared School in Addid Ababa, Ethiopia. This project is being managed through the ‘Hope for Children’ Australian charity which is recognised by the Ethiopian Government's Charities and Societies Agency as an international charity This school provides high quality bi-lingual education to impoverished and marginalised children in Ethiopia. 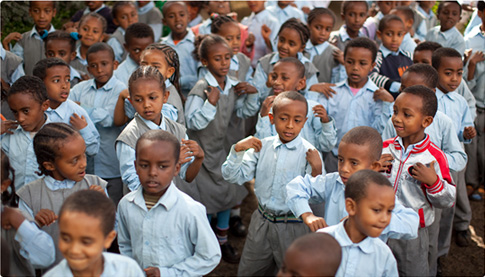 Hope for Children’s The School of St Yared provides first-class, bilingual primary education to some of the poorest children in Addis Ababa. The school was established in 2009 with the vision of giving the best opportunities to those children who would otherwise not get to school due to extreme poverty, poor health and family circumstance. St Yared currently caters for 309 kindergarten and elementary-level children at two bright compounds in the Francine area in Addis Ababa. The children receive two healthy meals plus a snack at the school each day, as well as school uniforms, essential learning materials and access to extra-curricular activities. We plan to expand St Yared in coming years to teach all the way to Grade 12.